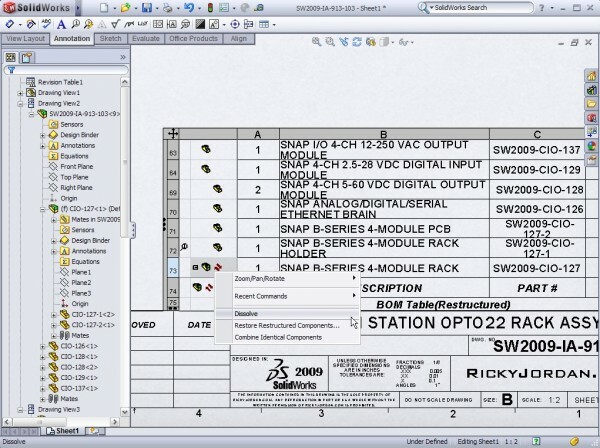 SolidWorks 2009 has been out long enough now that most of the “major” enhancements have probably been talked about on quite a few sites across the web. Here’s an enhancement that I have noticed hasn’t gotten much press. 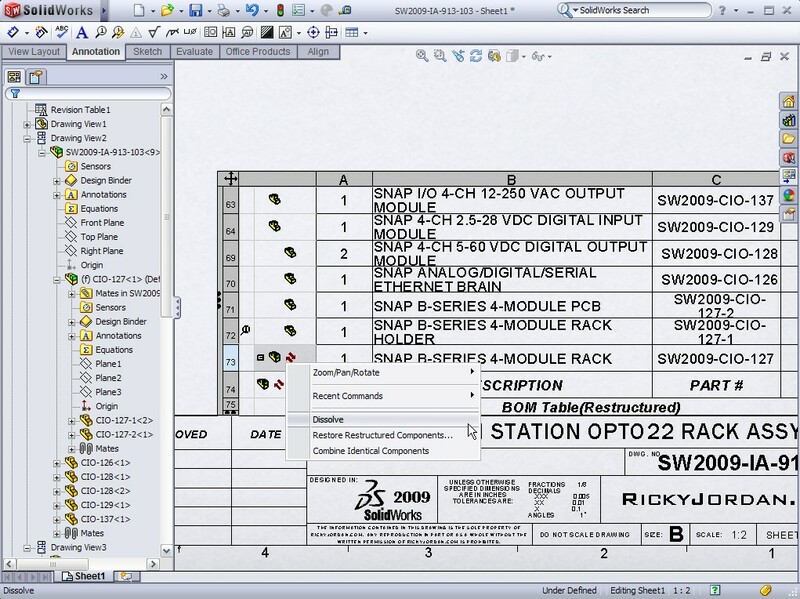 That enhancement is the ability to restructure Bills of Materials (BOM) in Drawings. 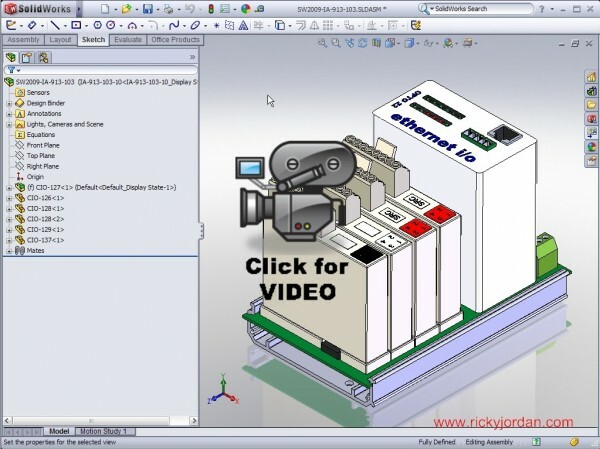 This video tip will show a simple example of this new capability that for some companies could be a game changer. I know that is an awfully big statement, but think about a situation where for assembly speed reasons, sub-assemblies are used in SolidWorks, yet build procedures call for parts and assemblies to be grouped differently. This functionality can support these instances. I’ve only tested it on a few assemblies, but it seems to work very well and is pretty easy to pick up. Click on the link below to see the Video Tip. SolidWorks World 2008: Finally in San Diego! Download the SolidWorks World App! Thanks so much for this information. We were trying to do this in 2008 but couldn't, so this is reason enough for us to upgrade. I'm glad you found the video useful. I was a bit surprised that no one commented on it when I posted it. I think this new functionality will benefit many users out there. I'm glad you like the site. If there is anything in particular that you would like to see added to the site, please let me know. I know that is an awfully big statement, but think about a situation where for assembly speed reasons, sub-assemblies are used in SolidWorks, yet build procedures call for parts and assemblies to be grouped differently. This functionality can support these instances. inform many people like me.. a video that very useful..
Puerto Rico is one of the places you head to for some fun and lastly for its casinos as well. when you have what it takes, can provide you with great returns also. is they are all located in hotels giving you the best of gaming at the same time as hospitality. as a lounge and bar that is worth lurking in between games. The casino is spread on the massive 13,000 sq. ft. and it has some of the best blackjack games imaginable. your luck within the slot machines. But online, you can play several games simultaneously. have a hobby also can participate in flash games and sports betting. There’s a reasonable excuse for that gigantic acclaim with the slots. of psychology, the hardest part of playing the slots is choosing a machine! After that, you simply insert your coin ( s ) and pull the handle. The next trick casinos use is making cashing out more challenging than it has to be. the casinos, actually, are depending on it! Again inside your avoid this trap shall be disciplined and not bet after you have decided to avoid.